[KHTS] – About 300 people came to the Nissan of Valencia Sunday afternoon for tri-tip tasting, pie tasting and live music at the Circle of Hope Tri-Tip Throwdown. 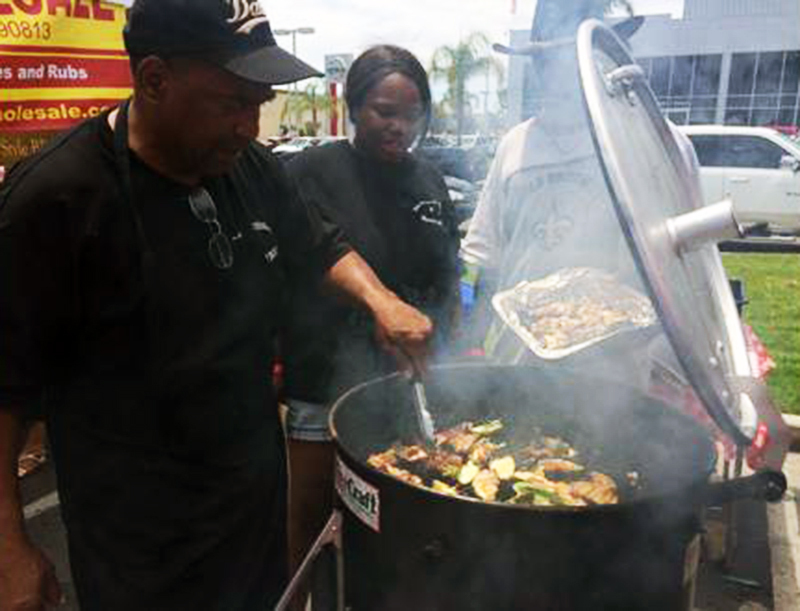 Guests were offered samples of tri-tip, side dishes and pies by individual cookers, restaurants and bakers. Sixteen individual chefs competed for a chance to win $500. Five restaurants competed for a chance to win a trophy as well as bragging rights. Blaze Patricio was one of the individual cookers competing, “This is great, I’m having a really great time.” Patricio is a backyard smoker and this was his first time in a competition. Andrew McCorkie won first place in the tri-tip contest as well as $500, Shawn Gayton won second place and $300 and Sean Miller won third place and $200. Smokin’ BarB Quties, owned by Soja Randal, was the restaurant that won the trophy. Pam Ripling won first place in the pie contest for her “Fruit of the Forest” pie, Brittany Tippet won second place for her cream cheese pie, and Rosemary Navarraro won third place for her cheesy crust apple pie. The pies were judged by Jill from Jill’s Cake Creations, Martha from Kokalita’s and Jennifer from Nothing Bundt Cakes. Circle of Hope Inc. provides emotional, financial and educational support to those diagnosed with cancer in the Santa Clarita Valley. Circle of Hope is dedicated to the Santa Clarita community. They started as a breast cancer organization 10 years ago and have been helping patients and families since. Circle of Hope is currently treating eight colon cancer patients, along with breast cancer and other patients. 100 percent of donations and proceeds remain the Santa Clarita Valley. Circle of Hope welcomes all members of the Santa Clarita community that have been affected by cancer of any kind including family, friends, and those who have long-since recovered from the disease. Their education and support services are open to everyone. And meanwhile, the dealership illegally parks their cars in handicapped spaces! Shame on you, Nissan of Valencia!